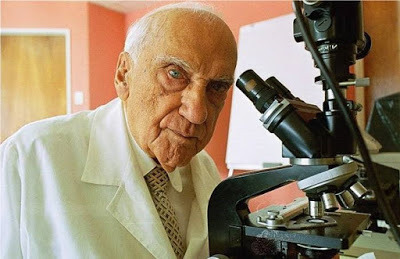 Jacinto Convit García was a Venezuelan physician and scientist, known for developing a vaccine to fight leprosy and his studies to cure different types of cancer. He played a significant role in founding Venezuela’s National Institute of Biomedicine and held many leprosy-related positions. Among Convit’s many honors for his work on leprosy and tropical diseases was Spain’s Prince of Asturias Award in the Scientific and Technical Research category and France’s Legion of Honor. In 1988, Convit was nominated for a Nobel Prize in Medicine for his experimental anti-leprosy vaccine. Convit García was instrumental in establishing a system of regional public health dermatology services in Venezuela, a network that expanded to include other endemic diseases and provided the backbone for medical care for several diseases. Through his dedication and charisma, he inspired a generation of like-minded health professionals who shared his goals. And through his clinical work, he was successful in classifying several dermatologically related diseases. A native of Caracas, born to an immigrant family from Spain,] Convit García undertook advanced training in the United States, attending Columbia, Case Western Reserve, and Stanford universities. Back in Venezuela, as he continued his work on leprosy and leishmaniasis, he was appointed to World Health Organization committees and played a key role in such associations as the International Leprosy Association. Convit García worked well into his 90s, contributing to our knowledge of diseases that typically afflict the poorest of the poor. His life work, which also included contributions to chemotherapy and immunotherapy, laid the foundation for the discovery of several vaccines. In Convit Group Inc. we pay homage to this distinguished Venezuelan, who with his example of life showed that the interest and welfare of the community are above personal interests when the objectives are oriented to the benefit of humanity. Creo en la juventud, son los que deben cargar un peso importante, hacer un esfuerzo enorme. Nosotros haremos, con el tiempo que nos queda, todo lo que podamos. Pero ellos tienen que hacer esa carrera de relevo. Hay que estudiar e investigar mucho y hay que pensar bastante. Debemos evitar que la medicina se convierta en un campo solo de dinero, y no olvidar que es también una profesión humanista. Ahora, lo que hay que hacer es aprovechar el tiempo y hacer las cosas lo mejor posible. Tratar de favorecer a la gente lo más que se pueda. Por eso pasé de mi trabajo en lepra y leishmaniasis, al cáncer.